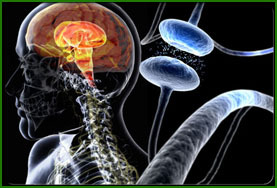 Parkinson's disease (PD) belongs to a group of conditions called motor system disorders, which are the result of the loss of dopamine-producing brain cells. The four primary symptoms of PD are tremor, or trembling in hands, arms, legs, jaw, and face; rigidity, or stiffness of the limbs and trunk; bradykinesia, or slowness of movement; and postural instability, or impaired balance and coordination. As these symptoms become more pronounced, patients may have difficulty walking, talking, or completing other simple tasks. PD usually affects people over the age of 50. Early symptoms of PD are subtle and occur gradually. In some people the disease progresses more quickly than in others.